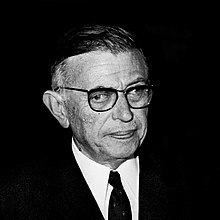 Jean-Paul-Charles-Aymard Sartre (French: [saʁtʁ]; 21 Juin 1905 – 15 Aprile 1980) wis a French filosofer, playwricht, novelist, poleetical activist, biographer, an leeterar creetic. ↑ 1.0 1.1 "Jean-Paul Sartre". Stanford Encyclopedia of Philosophy. Retrieved 27 October 2011.